Please Take Note: This is a review of the game’s final prototype. The art, game bits, and the rules discussed are all subject to change. The game is being reviewed on the components and the rules provided with the understanding that “what you see is not what you might get” when the game is published. If you like what you read and want to learn more, we encourage you to visit the game’s web page or Kickstarter project page to back it and get yourself a copy! Now that we have all that disclaimer junk out of the way, on with the review! The Zombie Apocalypse is upon us! Get out there and protect the remaining humans by taking out the most famous zombies you find! Zombies are among us and only have one thing on their rotting minds – eat the living. Of course, humanity won’t be going down without a fight, regardless of the odds. And the odds, well, they aren’t good. No matter! You must lead those who would follow you and take out the undead hoard before they get you! Later, when the survivors scramble back to camp, you can drop some names and boast about the more popular undead you took down. Never mind it cost you 10 or so “volunteers” to do so. 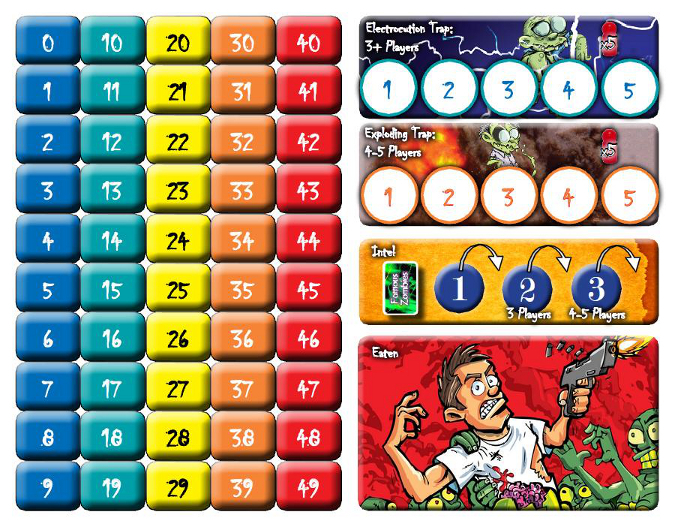 Famous Zombies, from Joe Magic Games, is comprised of 1 Player board, 1 Victory Point board, 8 Zombie pawns, 50 Player tokens (in 5 different colors, 10 for each player), 5 Player cubes (1 per player matching the colors of the Player tokens), and 36 cards. As this is a prepublished version of the game, we will not comment on the quality of the components. To set up the game, set out the Player board and the Victory Point board in the middle of the playing area. Have each player select a color and hand to that player all the Player tokens and cubes that match. Now look through the deck of cards and remove the Zombie Frenzy cards from the deck. For a 3-player game, put back the Zombie Frenzy cards for 3-players only (noted on the card) and remove the 4 to 5-player “Zombie Frenzy” cards from the game (they will not be used). If you are playing with 4 to 5-players, put back the Zombie Frenzy cards for 4 or 5-players only (noted on the card) and remove the 3-player Zombie Frenzy cards from the game (they will not be used). If playing exactly with 5-players, randomly select one of the 4 to 5-player Zombie Frenzy cards, only placing one back in the deck and removing the rest from the game. Reshuffle the deck and deal to each player 1 card, face-down. Each player will now look at their card, but keep it hidden from their opponents. If the player is dealt a Weapon card, no further action is needed. If the player is dealt a Zombie card, populate the Player board with the noted colored zombie, discard the card, and deal another card to that player. Repeat if another “Zombie” card is drawn. If the player is dealt a Zombie Frenzy card, discard it and deal them a new card. Reshuffle the deck if any cards were discarded and place the deck next to the boards in the middle of the playing area. This is the draw deck and there should be room next to it for a discard pile. Players now place their Player cube on the spaced marked with a zero on the Victory Point board and place the Player tokens in front of them. A starting player is selected at random and the game begins. But before we play, let’s get to know the game a bit more, shall we? 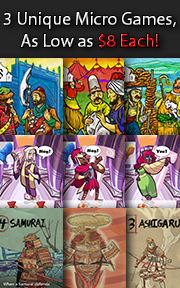 Weapon cards are the most abundant in the deck and will allow the player to complete actions in the game. Weapons can be guns, knives, utensils, vehicles, and many more things you can find in your home. It is surprising how many things can be used to fight the undead, actually. Who knew a hot iron, for example, would be useful? The Weapon card is loaded with information, but only specific parts of the card are used depending on the action selected by the player. This makes all the Weapon cards multi-purpose and beneficial on several levels, but also a limited resource that will quickly be out of the player’s hands. A zombie game wouldn’t be much of a game without shambling crowds of the undead. The Zombie and Zombie Frenzy cards will be drawn at random and will populate and determine movement of the zombies on the Player board. Zombie movement, like zombies themselves, is erratic, unpredictable, and slow. But slow does not mean they are not dangerous. Zombies will keep pushing forward and will not stop until they have eaten every brain or a player puts them down. The Player board is where the players and zombies will move, dodge, explode, be eaten, and encounter each other. To the player, it is the battle ground. For the zombie, it’s the buffet line. The entire board is comprised of a hexagonal grid. 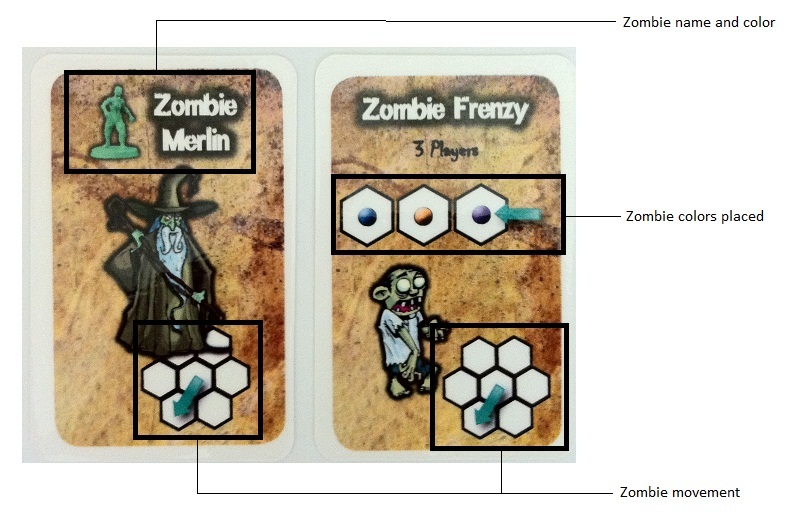 Movement direction on the Zombie and the Zombie Frenzy cards, as well as pattern tokens on the Weapon cards, will correspond to the hexes on the Player board. 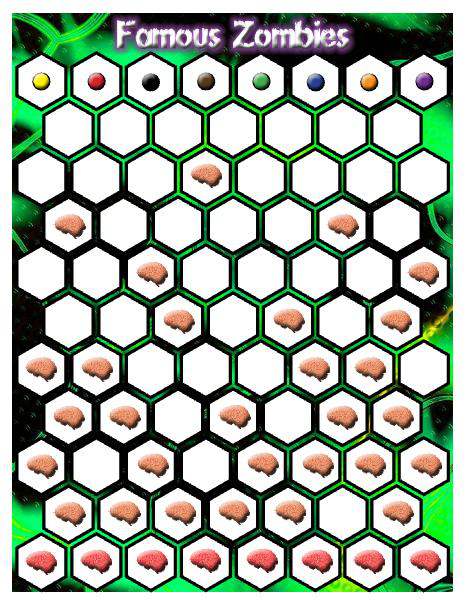 While getting injured from fighting the undead is a given, what the players need to protect the most is hexes on the Player board that contain the images of a brain. These spaces represent humans getting their brains munched on. Player tokens and Zombie pawns will be placed on this board. The Victory Point board keeps track of the points earned so far from all the players, traps the individual players have set up, which player gets more cards on their turn (intel), and which Player tokens are currently “eaten” (temporarily out of the game). Both the player’s cubes and tokens will be placed on this board. Having your troops (Player tokens) out on the field of battle will give the player more control of what is happening on it. 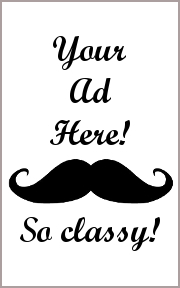 It also means more points can be earned, but less focus is put on gathering intelligence and building traps. But let us not discount the value of having majority control of the war zone. In order to populate the board, the player must use a Weapon card of their choice (you don’t want to send out the troops poorly armed, do you?). The Weapon card is discarded and the number of player tokens listed on the card are placed wherever there is an open space on the Player board. The player need not place their Player tokens in adjacent spaces, but they cannot occupy the Zombie pawn starting areas (located at top) or any space already occupied by a token or Zombie pawn. Building traps allows the player to remove zombies from the Player board when they land on one or more of their Player tokens. However, supplies are limited and building a trap is much more complicated and time-consuming than detonating them. In order to build a trap, a player must us a Weapon card, discarding it, and then places the number of Player tokens in a free trap space of their choice, but it must be the same trap. In a 3 or more player game, electrocution traps are available. For a 4 to 5-player game, the exploding traps are also available. Players will place their Player tokens in free Trap spaces, from left to right, indicating they are dedicating their resources to build traps for the troops in the field. The player who has majority control of the Trap area gets to use completed traps first and everyone else must wait. If there are no spaces available, no further Player tokens can be placed and are simply kept by the player for later use. Taking the fight to the zombie horde is a dangerous idea and one could argue it will only buy you time. After all, there are many more zombies then there are living people. Nevertheless, fight on you must. To do so, a player selects a Weapon card from their hand and discards it. There are two types of weapons. There are lethal (those that drop a zombie and make sure they never get up again) and non-lethal (which will more or less just upset a zombie and get them to move in a different direction). Both are very useful and for very different reasons. There are points to be gained for every zombie that is removed from the game and even more points to be gained if you can remove those zombies using traps. If using a non-lethal weapon, the player will move a number of zombies in the direction indicated on the Weapon card. These zombies can be located anywhere on the board. The player will also need to remove a number of Player tokens in the pattern indicated on the Weapon card. The pattern on the card can be reoriented to match what is on the board. The Player tokens used to complete the pattern can be any token currently placed (not just the ones that belong to the player). The player will be awarded Foolhardy points for their dangerous efforts and anyone who helped (other player’s tokens used to complete the required pattern) will be given points for the assist. If using a lethal weapon, the player will remove a number of zombies from the board as indicated on the Weapon card. These zombies can be located anywhere on the board. The player will also need to remove a number of Player tokens in the pattern indicated on the Weapon card. The pattern on the card can be reoriented to match what is on the board. The Player tokens used to complete the pattern can be any token currently placed (not just the ones that belong to the player). The player will be awarded 3 victory points for every zombie killed and anyone who helped (other player’s tokens used to complete the required pattern) will be given points for the assist. Sadly, casualties will occur. Those brave individuals who put themselves on the frontline to fight the zombies will sometimes not come home. But the war goes on and the ranks of willing individuals to “fight the good fight” must be replenished. This can be done by recruiting new allies. To do so, the player will play and discard a Weapon card. The player will then remove a number of their Player tokens from the Eaten space on the Victory Point board equal to the player token number on the Weapon card. These tokens are placed in front of the player and available to them on their next turn. You wouldn’t think that fighting brainless undead would take much in the way of planning, but being prepared will greatly improve the odds of survival. There will always be something around to help the players, but having access to more resources than can be used in a single turn is preferred. To do so, the player will discard a Weapon card and places a single Player token on the first spot in the Intel area located on the Victory Point board. As soon as the player does so, all the players (including the player who just placed the Player token) draws 1 card from the draw deck from left to right (smallest number to the largest number), for every token that belongs to them. Each player draws in turn and resolves any Zombie or Zombie Frenzy cards, redrawing until they get a Weapon card. If a player is bumped from the Intel area, their token is given back to them to use on their turn. Depending on the number of players, there will be more opportunity to gather intelligence. Makes sense, as more survivors means more eyes looking for a way to get the upper hand. At the end of the player’s turn, they always draw 1 card from the draw deck, resolving any Zombie or Zombie Frenzy cards. Play continues with the next player clockwise. At anytime during a players turn when they draw a card, there is a chance that the zombies will very slowly stumble into combat. Zombies are not smart, but they are persistent. This means that zombies are just as happy to attack a person with a juicy brain as they are about chomping down on an exploding trap. They will continue to march forward until they are destroyed. Like I said, zombies are not too sharp. But nor are they predictable. Their lack of intelligence makes them a very dangerous foe as you simply have no idea what they will do next or when. The best a player can do is set traps, anticipate based on assumption, and wait for the inevitable. When a Zombie card is drawn, two things will immediately happen. If the colored Zombie pawn is not on the board, it is found and placed at the very top of the Player board on the space that matches the Zombie pawn color (green space for the green zombie, for example). All zombies currently on the board now move in the direction indicated by the zombie movement pattern on the card. Zombies do not go off the Player board and will simply stand still if their movement would take them off. Likewise, zombies cannot occupy the same space as another zombie and will polity wait without pushing. Zombies are not smart enough to turn around and walk in a different directions if blocked. Sometimes more than one zombie will appear on the horizon. This happens when a player draws a Zombie Frenzy card. 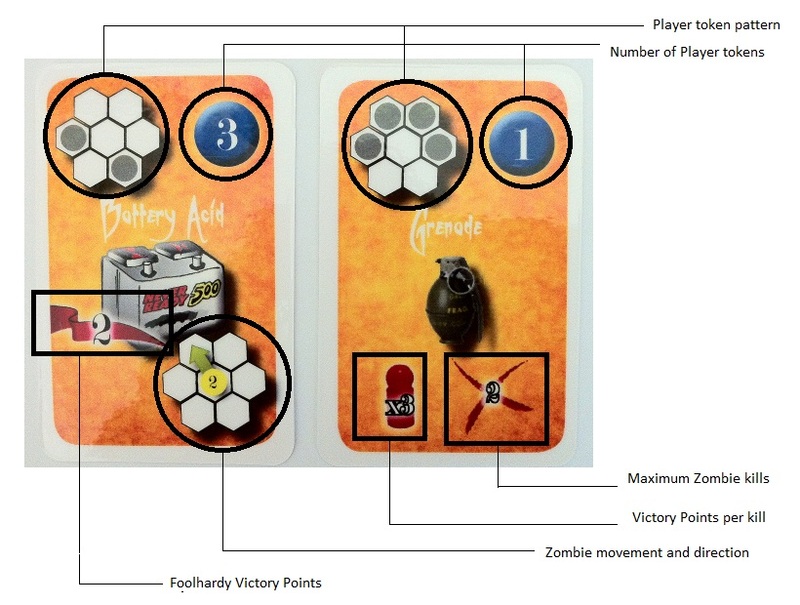 Like the Zombie card, the indicated colored zombie pawns are placed on their starting space on the Player board. This will happen for every color indicated on the Zombie Frenzy card. The catch is, however, that if that particular zombie is already on the board you go to the next space and fill that. If that zombie is also already out, you go to the next and so on. Long story short, zombies will quickly by in play. Then, like the Zombie cards, all the zombies then move in the direction indicated by the zombie movement pattern on the card. As already mentioned, a player can take the fight to the zombies by using Weapon cards and placing traps down for them to shamble over. But zombies can attack, too. If the owning player with the matching token has majority control of the Traps area (i.e. has the most player tokens), they can remove all their Player tokens from the controlled trap and any Player tokens on the Player board that a Zombie pawn is on. The Player tokens used are given back to the player. For their good work, all the zombies that touched the Player tokens on the board are destroyed earning them points. If any zombie ends their movement on a Player token, and that token is not on a brain space on the Player board, the token and zombie remain. If any zombie ends their movement on a Player token, and that token is on a brain space on the Player board (without triggering a trap), all players must immediately place one of their Player tokens into the Eaten space on the Victory Point board. These tokens can be taken from any place in the game except the Eaten space. For example, the player’s unused tokens, tokens in the Trap area, and even the Player board. Note that this happens once for every zombie that ends on a brain space and impacts all players. For example, if two zombies end their turn on a brain space, every player will lose 2 tokens. If any zombie ends their movement on an unprotected brain space, all players must immediately place one of their Player tokens into the Eaten space on the Victory Point board. After a player draws a Zombie card or a Zombie Frenzy card, resolving all zombie placement, movement, and combat, the player draws another card. If it is again a zombie related card, do it all again. Continue until the player draws a Weapon card. Point combos can be gained on a single turn. For example, a player can move a zombie (2 points) into a trap (5 points). When one or more players have all their Player tokens in the Eaten space on the Victory Point board. When one player has 50 or more points on the Victory Point board. When at least one zombie reaches the bottom line of red brains on the Player board. As soon as one of the three conditions are met, each player has one additional turn. Once completed, each player will receive an additional 1 point for every Player token not in the Eaten space. All the points are counted and the player with the most wins the game! 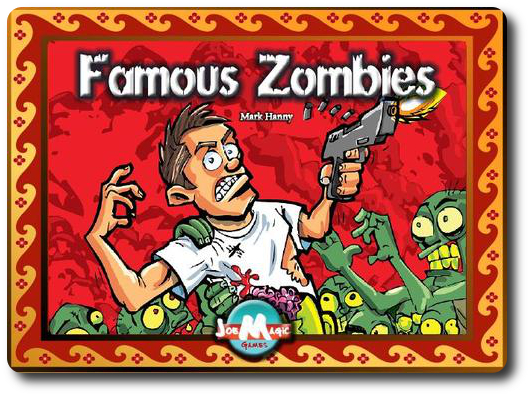 To learn more about Famous Zombies and read the complete rules, see the game’s web page or Kickstarter project page. Like myself, my little geeks like all things “zombie”. There is just something about zombies that is fun when it comes to games. Not that every game I have ever played that deals with zombies is a good game or one I find interesting. But on the whole, you can’t go wrong with a zombie game. They tend to be very direct in their game play and there is almost always some sort of combat included. This also makes many feel that most zombie games are the same. This is a true statement, to a point. This game, however, takes a very different approach from all the other zombie games I have played. Usually, zombie games have the player consider tactical movement, location, and timing. These elements are included to help the narrative of the game and communicate to the player a sense of urgency and being overpowered by the zombies. Famous Zombies has this but it is done in a very abstract way. Because it is abstract, the player must think about how they will combat the zombies using different tactics and strategy. For example, one of my all time favorite zombie games is Last Night On Earth where player and zombie movement and location is highly important. This is not the case in Famous Zombies. The focus is more on area control and worker placement which will provide the player more opportunities to complete actions. Of course, this also might make the game a bit more boring. Abstract games tend to be much less flashy and it is up to the player to “see” the action in the game instead of the game providing lots of neat bits. 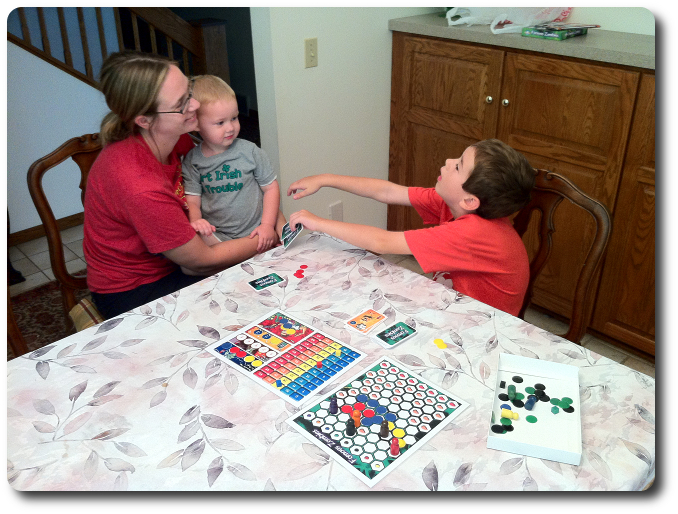 But abstract games also tend to be rather focused and this makes them easier to teach. Explaining the game to my friends and little geeks didn’t take long. As I said, it is very straight forward. The biggest confusion came from the pattern matching that is needed to use Weapon cards. This threw some of the players off as they didn’t understand how a pattern on the board meant use of a weapon in combat. This was easily handled by me explaining that the Player board represented the potential zombie threats and the possible actions taken by the players. “Oh,” they said, “This is like setting up for a big event?” Bingo. Once the players looked at the board as a pattern matching excise, everything fell into place. When I played with my 7-year-old, he liked this concept of “zombie combat” a great deal. And so, while I set up the board for our game, I asked the players what they thought of it so far. Let’s play the game and see if it delivers fun or is dead on its feet. Famous Zombies proved to be a unique game of strategy, tactics, and mixed cooperative game play. Technically, all the players are competing for points and racing to be the victors. In practice, however, everyone is dependent on the player to the left and right of them to gain points. Since Player tokens can be used by other players, and players depend on other players to help populate the Player board, everyone has to work as a team. But only to a point. You can lock other players out for Traps and push out other players who want to gather intel. You can also mess up a player’s chance to score big points by removing tokens from the Player board that would fit a specific Weapon pattern. But all of this is a secondary concern for the players as they must protect the brain spaces on the board. Everyone feels the pain when a zombie bits into a brain, which will keep all the players working together. When one or more players starts to lose tokens, that means everyone else has to work harder. Failure to do so will end the game quickly. This was not lost on my little geek and he became rather upset with me when he believed I was not focused on the “common good”. In his words, we had to work together to survive. Very true, but I also reminded him that survival was just part of the game. There was also the points to be won. A balance between helping your neighbor and taking points was needed. He recognized that but was still disappointed when I bumped him from the Intel area or held the Traps when he wanted to use them. At the end of the game, he was exhausted, enthusiastic, and ready to play again. Parent Geeks who liked zombie games were at first disappointed by the lack of luster the game provided, but quickly became involved when they saw the game start to roll over them. Parent Geeks who were used to Euro-style games caught on right away what was going on and were excited to try a zombie themed game using the game mechanisms they enjoyed. Both Parent Geek player backgrounds enjoyed it. All except the non-gamers. They simply did not “get it”, didn’t think much of the theme, and kept asking where the zombies were. Gamer Geeks recognized the game for what it was right away. A Euro-style worker placement and area control game with resource management requirements that had a pasted on theme. Of course, this is what they are used to and it made no difference to them. They found the game to be engaging, light, and a good time. The level of area control and worker placement on the Player board was impressive as the Gamer Geeks moved for best position and kept their Player tokens in key spots for use. Gamer Geeks, this is Euro-style worker placement and area control game that will require you to do a lot of resource management. Where you place your workers and when is just as important as when you don’t. The level of control you have of the board can swing from total dominance to seemingly zip. All the while, the zombies will shamble forward, which really only represents opportunities to gain points based on your Player token set up and not so much “survival”. Very abstract and heavily dependent on tactics and strategy, this game is sure to delight you. In the end, however, Euro-style gamers will most likely enjoy this game more than zombie horror survivor thrill seekers. Parent Geeks, this is a thinking game. Do not go into it believing you can just place pieces wherever and ride it out. You must have a plan and be constantly evaluating the Player board with what you have available in your hand. The number of Player tokens available to you at any time is secondary to how you use them. But the game plays light and is very forgiving for those who want to “learn as they play”. There is nothing really in the way of a bad move, only lost points. Of course, lose too many points and you won’t win, but you’ll learn a lot in the process. Non-gamers found the game to be a mystery, but a few caught on towards the end and were ready to give it another try once they “got it”. Child Geeks, this game is going to challenge you, but don’t think for a moment that the challenge is overwhelming. Because this is an abstract game, combat and earning points is about what you have on the board and in your hand and less about where your Player tokens are or are not. Every player must work together, but every player is also looking to be the winner. You’ll need to help and get help from others, but only to a point. Depend on too many and your points will be shared. Depend on no one, and you won’t get many points at all. In my opinion, Famous Zombies is a very unique Euro-style zombie game. I have not seen its like before and I found the rules to be simple, the game play to be familiar, and the entire experience to be challenging and rewarding. All the other zombies games I have played were focused on survival. This game is focused on outmaneuvering and out-thinking your opponents. Zombies are a means to an end for collecting points and are more like the big wave a surfer sets up for to ride in. If positioned correctly, the surfer will have a fantastic opportunity. For everyone else on the water, the wave will be nothing more than a missed chance. This served to be the winning point for me as I greatly enjoy games that reward the player for thinking things through and use very little luck to determine success. But a zombie game? No, not really. The zombies play second fiddle in this and the theme of the game could easily be replaced with aliens, robots, and even falling meteorites. Theme helped the artwork and narrative but has zero impact on the game play. I never felt chased or attacked by zombies, nor did I ever feel like I was taking the fight to the undead. But this was somewhat intended as the game is designed around the basic concepts that all Euro-style games share. Specifically, emphasis on strategy, very little luck, little player or board conflict, resource management, and keeping all the players in the game until the end. To which, Famous Zombies does an outstanding job and delivers. If you have been hungry for a Euro-style game with a zombie theme, now is your chance to get one. Tagged Father Geek Approved, Gamer Geek Approved, Parent Geek Approved, Prepublished Games, Zombie Games. Bookmark the permalink.